﻿ News Bharati - Extended High Josshh..!! Celebrating Republic day beyond the seas..! News Bharati - Extended High Josshh..!! Celebrating Republic day beyond the seas..! Extended High Josshh..!! Celebrating Republic day beyond the seas..! New Delhi, January 26: The Indian Community in China have alike oathed to bridge the gap between the two nations. 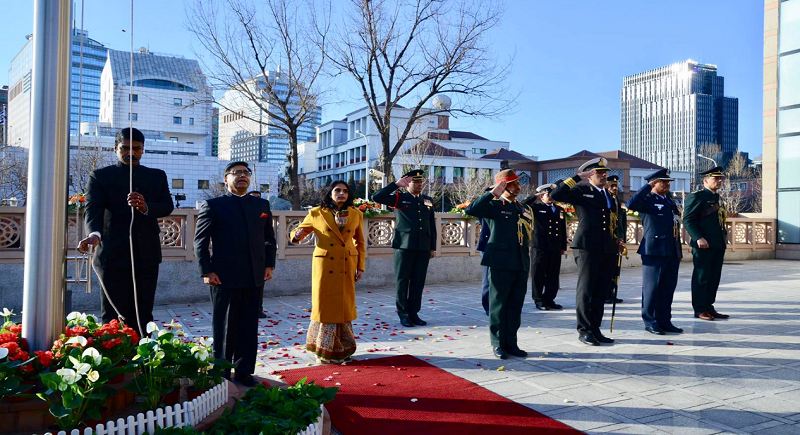 Citing the occasion of 70th Republic day in India, the Indian Embassy positioned in Beijing celebrated the day with Ambassador Vikram Misri unfurling the tricolour there. He read the President’s excerpts message to the nation for the community. The event was organised in collaboration of the China Telegu Association and Indian Medical students from Tianjin medical university. The Indian Embassy Team in China pledge to keep the Josh running high and work for the beloved motherland! “We also salute our armed forces for their contribution to our great nation”, they yelled. Written records of contacts between India and China date back to at least 2nd century B.C. Such contacts at the level of people through commerce got a fillip with the advent of Buddhism into China from India in the first century A.D. under imperial patronage. The early fifties and the Hindi-Chini Bhai Bhai phase of 1950s witnessed a further strengthening of these ties. The resumption of political relations in 1980s further has provided an impetus to cultural exchanges.